When a coach or captain requests a time out, the second referee whistles and steps to the side of the net of the team requesting the time out. 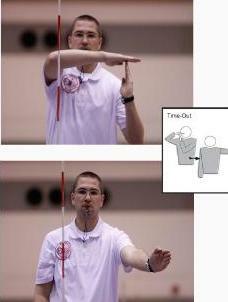 If the time out is on the right of the second referee, the R2 uses the right hand to form the stem of the T, with the left hand forming the horizontal portion of the T.
If the time out is on the left, the left hand will be the stem of the T, while the right hand forms the horizontal portion. The conclusion of the signal has the hand forming the stem pointing towards the bench of the team requesting the time out. The first referee repeats the time out signal also indicating with the appropriate hand to the team bench. After signaling the time out, the second referee will show the first referee the number of time outs taken by each team. This is done by showing hands about shoulder height in front of the body. The first referee only shows the time out signal and does not indicate the number of time outs taken by each team. The second referee then begins timing the time outs. The second referee then checks with the score keeper that the visible score is correct and all the information on the score sheet is recorded properly. At the end of the time out, the second referee will whistle the conclusion of the 30 seconds. There is no warning whistle. There is always a whistle at the end of the time out even if both teams have taken the court before time has expired. If a team hasn't taken the court after your whistle, the second referee will then step towards the team huddle and politely encourage the team to take the court. If needed, it may be appropriate to whistle a second time to encourage teams out of their huddle. When both teams are on the court and after you have ensured the scorekeeper and assistant scorer are ready for play to resume, the second referee will move into position for the next serve. With whistle in mouth, the second referee scans both sides of the court and gives the court back to the first referee with the ready signal. If the time out called is the second team time out, the second referee will relay this information to both the team and the first referee. After whistling both teams back onto the court, the second referee will indicate the number of time outs taken to the captain or coach who has taken both time outs. When there is no coach, the second referee may need to step onto the court to notify the captain. A substitution request is made ONLY when a substitute enters the substitution zone. This means the coach or captain may not request a substitution. Do not whistle a verbal request for substitution. When a team wants to sub more than one player at a time, only one substitute per team in the substitution zone at a time. A team may have only one request for substitution during any interruption. Also, any number of substitutions may take place with that one request.